Help the brave rescue team to save injured animals and frightened people! So we know most of you enjoy escaping to exotic tropical islands and fantasy farms during your FreeRide Games play, but what about trying some heart palpitating urban rescue missions for a change? We’re talking about Rescue Frenzy and it will get your adrenaline pumping faster than a rooster can crow :). Seriously though, we highly recommend this Time Management game for its thrilling present day rescue missions and strategic challenges. 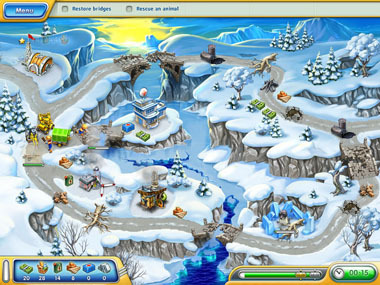 Rescue Frenzy is actually a sequel to the resource management game Rescue Team, but it has a totally different plot and setting. 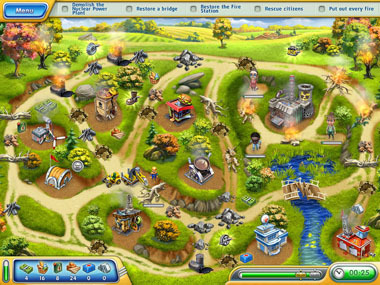 You’ll enter a world that looks like yours, filled with big modern buildings and busy streets. You and your courageous team of rescue workers must deal with the after effects of destructive storms, fires and earthquakes. You’ll have to race against time to clear away the wreckage, collect resources for renewing the town’s power stations, hospitals and bridges and save fellow citizens and animals in distress. You’ll be able to accumulate power ups to boost your speed as you drive powerful vehicles to save the day. At the start of each level, you watch a TV report that informs about the current dilemma and your objectives. For example you must rebuild a fire station or save somebody in danger. You may even have to destroy a nuclear power plant or two to avert a terrible catastrophe. You can accomplish your objectives in Normal, Master or Expert time so success is definitely in reach. We spent about 6 hours carrying out the cliff-hanging missions in this game’s 45 levels. You and your team will need to collect resources like money, fuel, metal and medicine from gas stations, material shops, hospitals and more. Resources can also be collected along the way. Say you are repairing a pumping station, look around for some metal scraps that you can you can snag for your next undertaking. 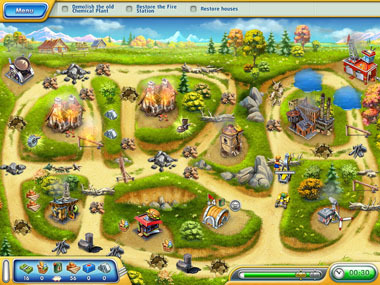 What really adds an exciting layer to Rescue Frenzy is the strategic planning you need to succeed. Sometimes you’ll find yourself in a difficult rescue scenario where you will be lacking services under your control like a gas station or first aid medicine. Also, the order you rebuild structures and accomplish your objectives really matters. For example, you might not be able to upgrade a specific building if you don’t save an animal first and earn money for a job well done. The ultimate goal in Rescue Frenzy is to make the Master ranking. We know you can do it! All you need are some problem solving skills and A LOT of courage. 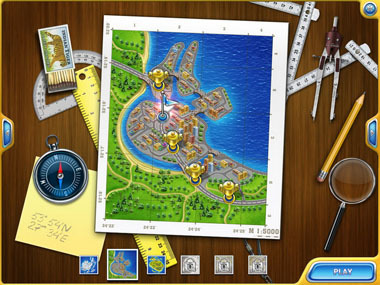 Hurry, everyone is waiting for you – SAVE THE TOWN FROM DESTRUCTION!!! do not bring up any more games on my screen for me to try. I am impressed! I am 62 years old, female, retired from nursing and have a little time that I like to spend playing PC games. And I LOVE to play games I can play to the end. This is one of those games! RESCUE FRENZY is wonderful. Love the variety in “rescues”, and “repairs” and the whole rest of the game too.